Spearfishes (genus Tetrapturus) are the rarest and least understood members of the billfish family. 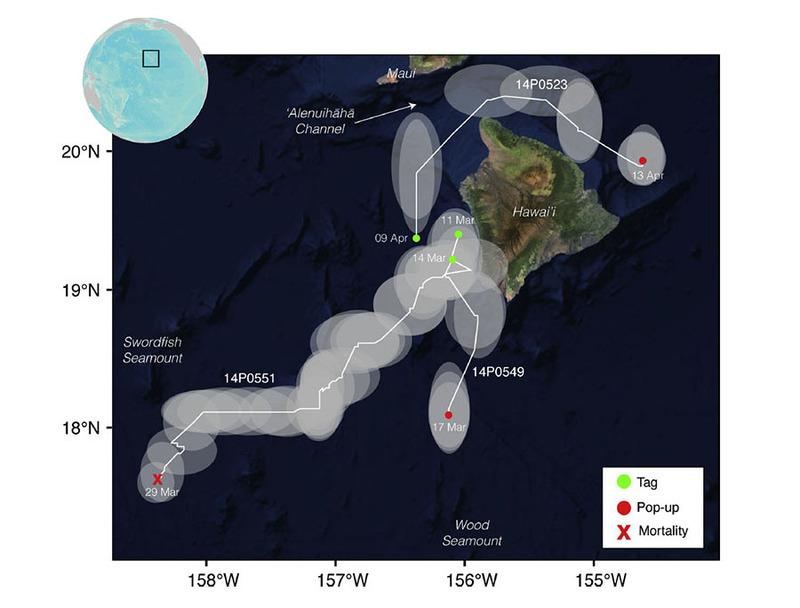 Late last year, IGFA Representative Martini Arostegui and colleagues, Camrin Braun and Peter Gaube, published research on the first-ever satellite tag deployed on a Mediterranean spearfish (Tetrapturus belone) as part of the IGFA Great Marlin Race (IGMR). Hot off the presses is yet another publication by Arostegui and colleagues, this time focusing on shortbill spearfish (Tetrapturus angustirostris) that were tagged off Hawaii as part of the IGMR—another scientific first! Between February and April in 2015, six satellite tags were deployed on shortbill spearfish by IGFA Trustee Chase Offield and his father and former IGFA Chairman Packy Offield. Previously, no satellite tags had been deployed on shortbill spearfish and information on their thermal preferences and behavior was nearly nonexistent. As such, the goal of this research was to describe the movement ecology and thermal niche of this understudied species. Their study found that, on average, tagged spearfish spent greater than 90% of their time at depths less than 100 meters in water temperatures between 24 and 26 °C. Their narrow thermal distribution reported from this study is similar to what was found in the Mediterranean spearfish study and suggests that they are less tolerant of colder water temperatures than other species of billfish. This is most likely explained by the fact that spearfishes, in general, are the smallest billfish species. As a result, they have less “thermal inertia”, meaning that they lose body temperature more rapidly and therefore can spend less time in deeper, cooler water. In addition, all billfish possess an adaptation in the form of cranial heater tissue that allows them to generate heat in the head region. However, in spearfishes this tissue is less developed and likely contributes to them having a narrow thermal niche. One of the most interesting findings of this research relates to the diving behavior of shortbill spearfishes. Tag data from the IGMR and other studies have found that billfish have distinct diurnal and nocturnal diving behaviors. During the day, most billfish species make periodic deep dives in search of prey and at night spend most of their time in the upper portion of the water column. Shortbill spearfish appear to exhibit the opposite behavior, typically residing near the surface during the day and diving repeatedly at night. It appears that they may dive at night to prey on mesopelagic (mid-water) species that typically reside in deeper waters beyond their thermal tolerance during the day but migrate closer to the surface at night. 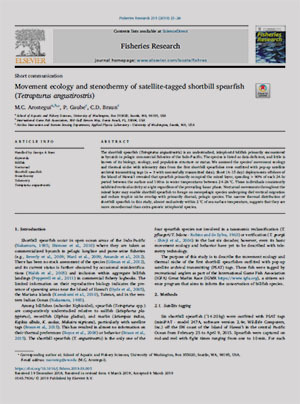 This is also supported by previous research that found that shortbill spearfish prey on a combination of epipelagic (surface) and mesopelagic species. The full version of this new publication is available free to the public and can be downloaded, but only for only a short period of time. Download a copy today to learn more about this enigmatic species that also happens to be one of the most elusive species in the coveted IGFA Royal Billfish Slam.